Silence: I have to admit that Silence is my favorite of my Virtues. I'm an introvert so an excuse to not talk is welcome in an otherwise loud world. That said, Silence as a virtue is not just about me being quiet but also about listening to others. I wrote about a technique that could help this week as well which was an unintentional but helpful dovetail. What gets me is unhelpful Silence where I am doing myself or others pain by not talking. Silence should never become a reason to disengage from others or ourselves. It is hurtful, unproductive, and just dumb. Otherwise, focusing on this virtue had been great for the day job. I just changed teams and am spending a lot of time observing my new team members and team writ large. Doing that in intentional silence unearths a trove of information. Moderation: so let's just start with the worst, yeah? I have fallen into bad eating patterns - morning pastries and no protein. My waistline objects as fervently as my carb addiction pushes me into the bad habits. I'm hoping to lean on a new office location as a way to break the current trend as I'll no longer be walking by the easy source if bad breakfast food. Ideally, I'd like to get back into intermittent fasting which can do wonderful things for my wight and mental clarity. Chastity: I wrote about Chastity too this last week and I think it'll be an evergreen idea. You don't get the things you don't ask for, especially in relationships. While I don't have a huge libido, it's still there and should be acknowledged. The take away from the article is that it is ok to want things but you do have to ask for them. No one reads minds. Thursday: I was rocking on all cylinders on Thursday, man. Great integration and productivity at work, great conversations with people, decent diet and a great exercise day. I have zero idea, frankly, what did it but when I figure it out I'll, be sure to end it to everyone. You can be your own business Why http://www.yesandyes.org/2015/09/you-can-be-your-businesss-why.html I'm actively exploring making Wrestling With Franklin a full time job and in that exploration, I've been read a lot on entrepreneurship. This article is especially relevant i search for the Why in my futures. I bet you could use a little clarity on your Why? 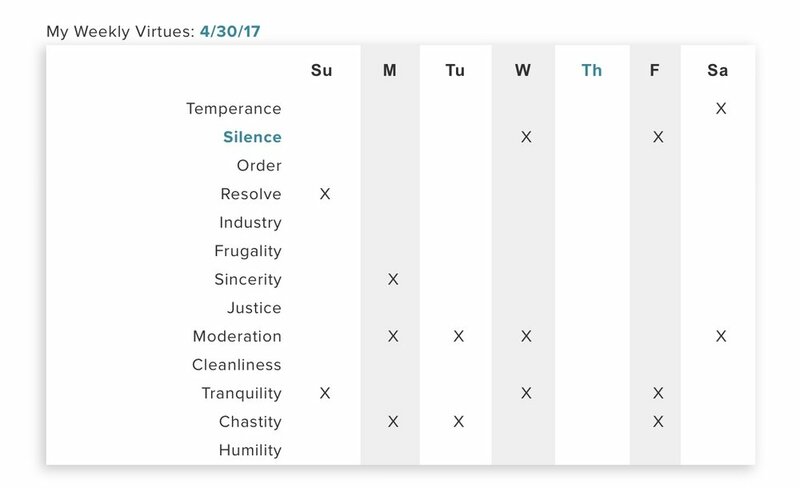 What to do when you have too many ideas and not enough time http://jamesclear.com/pruning When people ask about how to start a Virtue Project and if they have to follow 13 virtues, I tell them he'll no. I don't recommend anyone track that many at first. The only reason I did was because I was at a crisis point and knew I needed to do something. Taking Franklin's virtues wholesale was expedient. For you? Start with fewer and get really good at them. James Clear talks elegantly about cutting back All The Things so the few can flourish. Have a story to share from your own projects? Send them my way! I love hearing you're doing and maybe we can brainstorm some neat things to try if you're feeling stuck.